Have a Holly Jolly Christmas. It's the best time of the year! Wishing all of my Flickr friends, acquaintances, and visitors a very Merry Christmas and Healthy, Prosperous New Year! 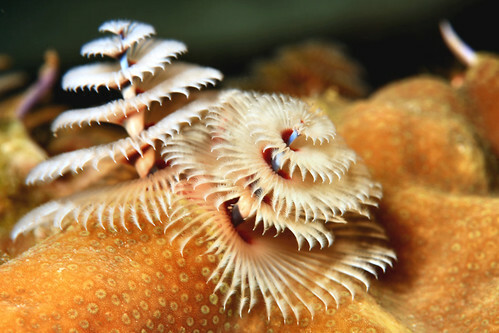 The Christmas Tree Worm (Spirobranchus giganteus) This appropriately named animal is very common on Caribbean reefs. The worm actually lives inside the coral head. The two spirals you see are part of its mouth. The worm uses these primarily for eating, but they are also used for respiration. So you'll frequently hear them refered to as gills.